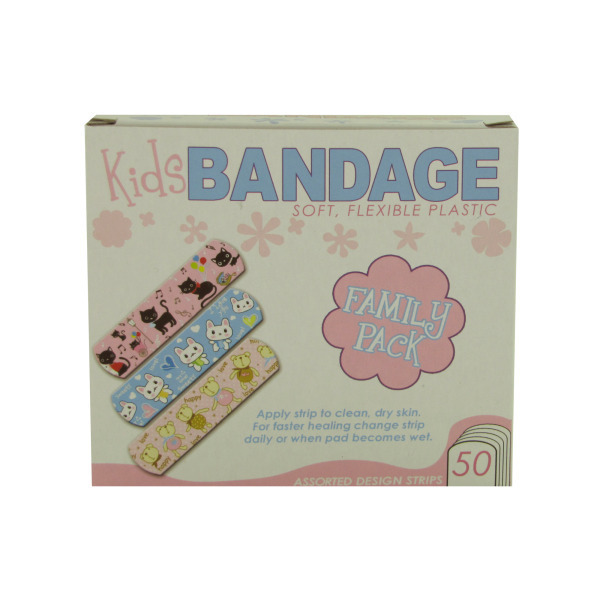 This 50 pack of kid's design bandages are great for helping wounds heal faster, will not stick to wounds and come in fun assorted designs to fit your mood. Designs include: pink bandage with black kitties and balloons and music notes, a blue bandage with white bunnies and hearts, pink bandage with white polka dots and teddy bears. Each bandage is soft and flexible. Bandages come packaged in a fun design box. Box has instructions for use. Each bandage measures 3/4" x 2 7/8"